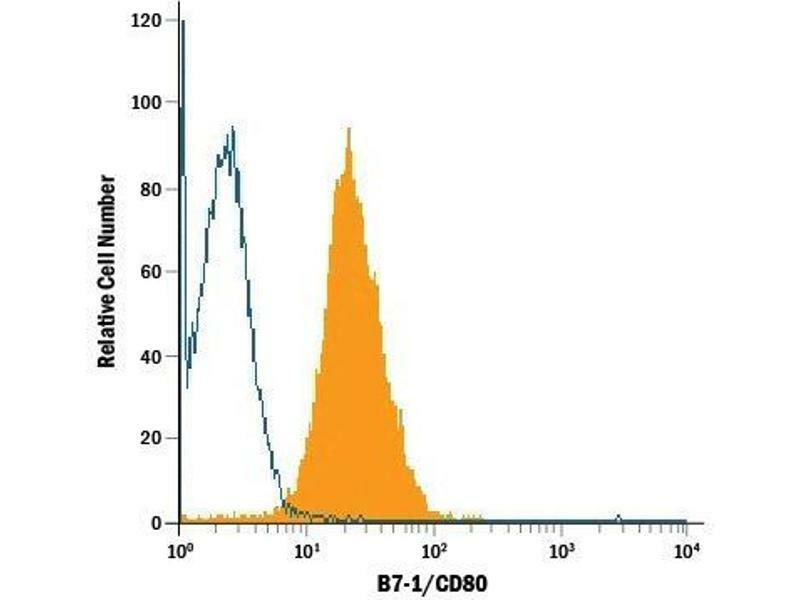 Detection of B7-1/CD80 in Raji Human Cell Line by Flow Cytometry. 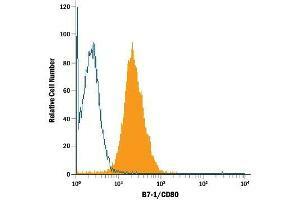 Raji human Burkitt's lymphoma cell line was stained with Mouse Anti-Human B7-1/CD80 Monoclonal Antibody. 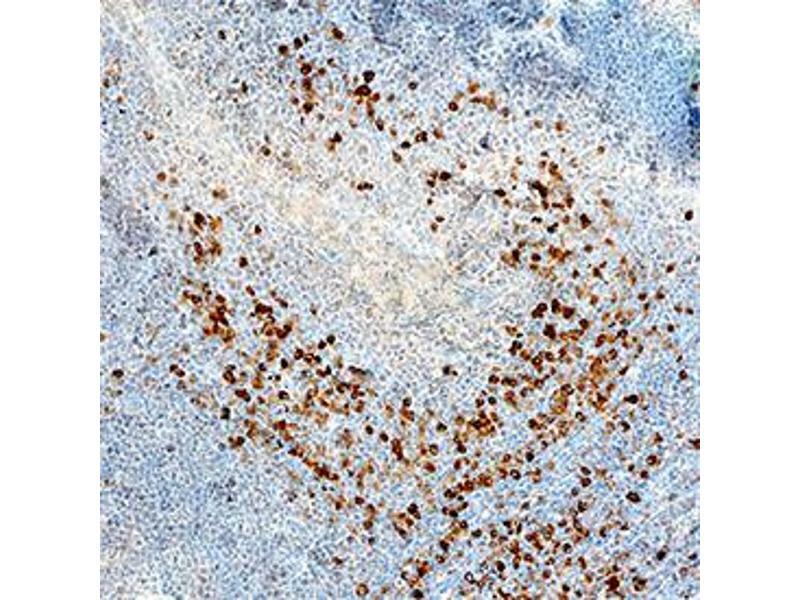 IL-2 secretion Induced by B7-1/CD80 and Neutralization by Human B7-1/CD80 Antibody. 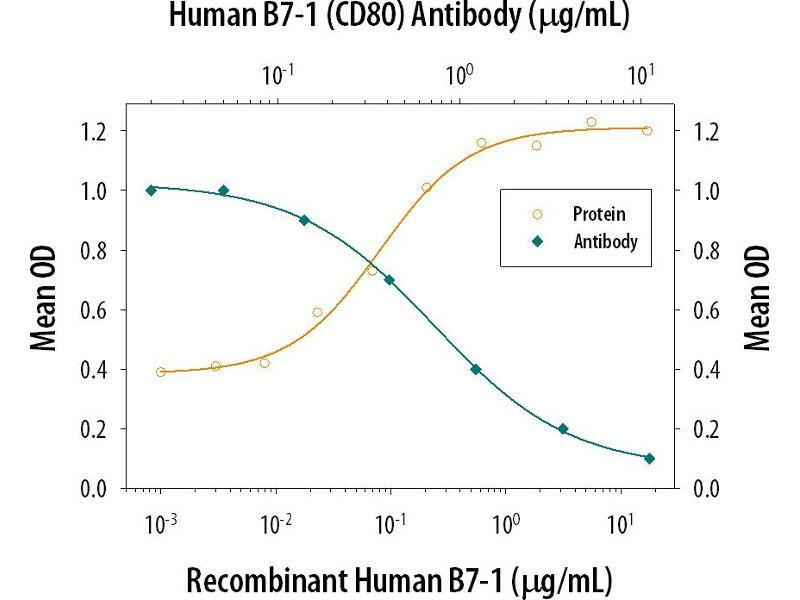 Specificity Detects human B7-1/CD80 in ELISAs. 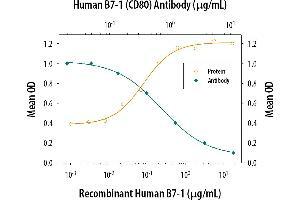 In sandwich immunoassays, no cross-reactivity or interference with recombinant human (rh) B7-2, recombinant mouse (rm) B7-1, rmB7-2, rhB7-H1, rhB7-H2, rhB7-H3 or rmPD-L2 is observed. 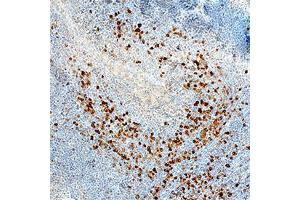 Ribot, Debarros, Mancio-Silva, Pamplona, Silva-Santos: "B7-CD28 costimulatory signals control the survival and proliferation of murine and human ?? T cells via IL-2 production." in: Journal of immunology (Baltimore, Md. : 1950), Vol. 189, Issue 3, pp. 1202-8, 2012 Method employed by authors: Neutralization (Neut) (Sample species: Human). Kosaka, Yashiro, Sakate, Hirakawa: "A synergistic antitumor effect of interleukin-2 addition with CD80 immunogene therapy for peritoneal metastasis of gastric carcinoma." in: Digestive diseases and sciences, Vol. 52, Issue 8, pp. 1946-53, 2007 Method employed by authors: Neutralization (Neut) (Sample species: Human).